Paul Stanley or better known as "The Starchild" among the KISS fandom took the stage with his ten piece ensemble, Soul Station. The unmasked sixty-three year old rocker crooned soulful R&B covers to an intimate audience at West Hollywood's Roxy club. The band made their debut on Friday night. 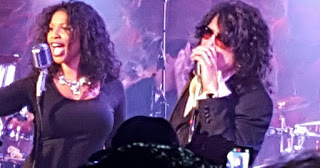 The Soul Station lineup consisted of: Paul Stanley (vocals, tambourine), Longtime KISS drummer Eric Singer (drums, backing vocals), Sean Hurley (bass), Alex Alessandroni (keyboard), Ely Rose (keyboard), Rafael Moreira (guitar), Crystal Starr, Ayana Layli, Nelson Beato (backing vocals) and Ramon Yslas (percussion). Even though no KISS songs were played, Gene Simmons and Bruce Kulick were spotted showing their support in the VIP section. "There was a time long ago when you'd turn on the radio and you'd hear songs written by real songwriters, sung by real singers, played by real musicians," reminisces Stanley. A KISS member playing Motown and Philly soul is quite an unexpected surprise. However, Stanley explained his passion for these songs because of their optimistic messages and that they weren't created by a computer! The Temptations; "Just My Imagination", The Delfonics' "La-La Means I Love You," The Five Stairsteps' "O-o-h Child," and The Spinners' "Could It Be I'm Falling In Love" were just a few of the many classic hits in the setlist. His vocals were a bit hard to hear, which were overpowered by the backups or drowned out from the bass. This caused a bit of a minor frustration among the audience. As some could be heard shouting for the mic to be turned up! Stanley's impressive falsetto and Soul Station playing the songs' original composition made up for the minor sound problem. No over the top instrumentals or heavy metal riffs were used at all during the night. What better way to honor the greats than to play their music authentically. "These songs mean a lot to us. They're beautiful songs. You could sway and touch the person next to you--you could also get punched in the face," jokes Stanley. His positive attitude was very infectious throughout the night. The fans were seen swaying and singing along in an admirable fashion. Everyone seemed to have as much love for the classics as Stanley. No KISS song requests were being shouted out! "We've got great, great singers. I would be nothing without these singers," Stanley admitted, referring humbly to his backup singers. At one point lead vocals were passed to backup singer Crystal Starr during Jackson 5's "I Want You Back." Starr's powerhouse voice really uplifted the mood. She nailed every high note while Stanley played the tambourine. This was perhaps the biggest highlight of the night considering everyone was up and dancing at this point. More Soul Station tour dates are expected to be announced soon. The show's performance will also be released on DVD.